Turns out the fortune cookie that came with your chop suey isn’t actually Chinese … and neither is the chop suey. So where did they come from? Jennifer 8. Lee: The hunt for General Tso In this TED Talk, journalist Jennifer 8. Lee shares the origins of some of America’s favorite “Chinese” food, and takes us on a culinary tour of Chinese restaurants around the world — whose menus often do not resemble those of restaurants in China. This week’s TEDWeekends on the Huffington Post explores culinary cross-cultural evolutions, with great essays about the origins of our associations between cuisines and cultures. Below, find three great essays to pique your interest. And make you hungry. When I was researching my book on Chinese food in America, The Fortune Cookie Chronicles, it puzzled me why Korean cuisine (unlike many of its Asian brethren) had not gone mainstream yet. When I was studying Asian languages in Italy, back in the 1980s, the few Chinese restaurants open in my native city of Rome only served two kinds of desserts: fried fruit and fried ice cream — the unlikely creation that Jennifer 8. 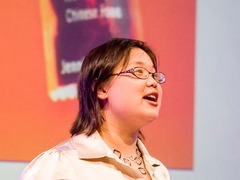 Lee singles out in her TED Talk about Chinese American food. When I moved to Beijing to pursue my studies, I soon discovered that these crunchy treats are unheard of in China. Chinese cooks in Italy likely came up with the concoctions to meet the expectations of Italian customers. A photo of my expecting mother eating a slice of watermelon is a family favorite. She attributes my lifelong disdain for the fruit to the fact that she ate it every day while pregnant with me. I carry this story in the form of an oval, deep green blemish on my left hand. It’s true — I’m a black man with a watermelon for a birthmark. TED Weekends wonders: What’s the key to memory? Brings to you the best and most delicious Asian recipes at your fingertips. From healthy recipes for soups and salads to main course and desserts, we have a mouth-watering spread of the best Asian food.